The Oaks Aire 9 Light Chandelier Is A Quality Cast Brass Two Tier Ceiling Light In A Chrome Plate Finish, Dressed With 30% Lead Crystal Sconces, Spheres And Drops. The Oaks Aire 9 Light Chandelier Is A Quality Cast Brass Two Tier Ceiling Light In A Gold Plate Finish, Dressed With 30% Lead Crystal Sconces, Spheres And Drops. The Oaks Aire 9 Light Chandelier Is A Quality Cast Brass Two Tier Ceiling Light In A Titanium Plate Finish, Dressed With 30% Lead Crystal Sconces, Spheres And Drops. The Kolarz Amaro A1335.88 is an opulent, traditional gold chandelier with sparkling optic crystals. The Franklite Artemis 8 Light Chandelier is in a Bronze finish with crystal a glass column and sconces. The Franklite Artemis 8 Light Chandelier is in a Chrome finish with a crystal glass column and sconces. The Kolarz Ascot 0195.88.4 is in antique brass with fabric shades and Murano glass detailing. 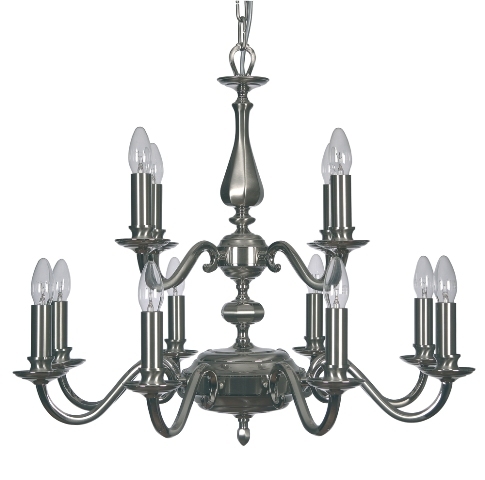 The Oaks Aylesbury Cast Brass 12 Light Two Tier Chandelier is in a Satin and Polished Nickel finish. The Oaks Bahia 12 Light Two Tier Chandelier is an impressive cast brass chandelier in a Chrome finish. The Oaks Bahia 12 Light Two Tier Chandelier is an impressive cast brass chandelier in a Gold plate finish. The Oaks Bahia 9 Light Chandelier is an impressive cast brass chandelier in a Titanium finish. The Kolarz Carat 0232.812.5.KpT is in a chrome finish with crystal spheres and sconces. The Kolarz Carat 0232.88.5.KpT is in a chrome finish with crystal spheres and sconces. The Kolarz Carat 0232.812.3.KpT is in a gold finish with crystal spheres and sconces. The Franklite Carousel 15 Light Chandelier is a larger scale ceiling light in a Soft Bronze finish with crystal candle pans. The Franklite Carousel 15 Light Chandelier is a larger scale ceiling light in a Chrome finish with crystal candle pans. The Franklite Carousel 15 Light Chandelier is a larger scale ceiling light in a Chrome finish with crystal candle pans and pleated black candle shades. The Franklite Carousel 8 Light Chandelier is a larger scale ceiling light in a Soft Bronze finish with crystal candle pans. The Franklite Carousel 8 Light Chandelier is a larger scale ceiling light in a Chrome finish with crystal candle pans and pleated candle shades. The Oaks Cobra 9 Light Two Tier Cast Brass Chandelier is in an Antique Brass finish with lead crystal drops. The Oaks Cobra 9 Light Two Tier Cast Brass Chandelier is in a Polished Chrome finish with lead crystal drops. The Franklite Damask 12 Light Two Tier Chandelier is in a Chrome finish with crystal glass candle pans and drops. The Franklite Delft 12 Light Two Tier Chandelier is a Polished Brass Flemish style ceiling light with brass candle tubes. The Franklite Delft 18 Light Two Tier Chandelier is a larger scale Polished Brass Flemish style ceiling light with brass candle tubes. The Franklite Delft 21 Light Three Tier Chandelier is a Polished Brass Flemish style fitting with brass candle tubes. The Franklite Delft 32 Light Three Tier Chandelier is a larger scale Polished Brass Flemish style ceiling light with brass candle tubes. The Franklite Delft 8 Light Chandelier is a Polished Brass Flemish style ceiling light with brass candle tubes. The Franklite Desian 8 Light Chandelier is in a Chrome finish with small faceted crystal glasses. The Oaks Dorchester 12 Light Two Tier Cast Brass Chandelier is in a Polished Chrome finish. The Franklite Elena 12 Light Two Tier Ceiling Light is in a Chrome finish with crystal glass candle pans. The Franklite Elena 12 Light Two Tier Ceiling Light is in a Chrome finish with crystal glass candle pans and translucent Silver candle shades. The Franklite Elena Double Wall Light is in a Chrome finish with crystal glass candle pans. The Kolarz Gioiosa 12 Light Crystal Cascade Semi-Flush Ceiling Light is in a Chrome or Gold finish with a Black or White fabric shade and a glittering central crystal cascade. The Kolarz Gioiosa 12 Light Crystal Cascade Ceiling Pendant is in a Chrome or Gold finish with a Black or White fabric shade and a glittering central crystal cascade. The Firstlight Jasmine 16 Light Chandelier is in a Chrome finish with clear glass shades. The Oaks Lienz 12 Light Empire Crystal Chandelier is in Chrome and Asfour Lead Crystal, creating a modern crystal chandelier. The Oaks Lyra 12 Light Crystal Chandelier has three tiers of Chrome finish fretted metalwork and swathes of sparkling crystal bead drapes. The Oaks Lyra 16 Light Crystal Chandelier has five tiers of Chrome finish fretted metalwork and swathes of sparkling crystal bead drapes. The Franklite Montagu Large Interior Lantern is a traditionally styled interior lantern in a Bronze finish with bevel edged curved glass panels. The Franklite Montagu Medium Interior Lantern is a traditionally styled interior lantern in a Polished Brass finish with bevel edged curved glass panels. The Franklite Montagu Medium Interior Lantern is a traditionally styled interior lantern in a Bronze finish with bevel edged curved glass panels. The Franklite Montpelier Large Interior Lantern is a traditional hexagonal Polished Brass interior lantern with bevelled glass panels. The Franklite Montpelier Large Interior Lantern is a traditional hexagonal Bronze interior lantern with bevelled glass panels. The Kolarz Moon Decor Sun Extra Large Wall Light is a hand-painted glass light in a textured Copper finish. The Kolarz Moon Decor Sun Large Wall Light is a hand-painted glass light in a textured Copper finish. The Kolarz Moon Decor Sun Extra Large Wall Light is a hand-painted glass light in a textured Gold finish. The Kolarz Moon Decor Sun Large Wall Light is a hand-painted glass light in a textured Gold finish. The Kolarz Moon Decor Sun Extra Large Wall Light is a hand-painted glass light in a textured Silver finish. The Kolarz Moon Decor Sun Large Wall Light is a hand-painted glass light in a textured Silver finish.